To celebrate the upcoming Mother's Day 2017, The Peranakan has prepared Yesteryears Set Menu. It is a combination of their signature dishes with some yesteryears dishes from Chef Raymond Khoo family recipes book. 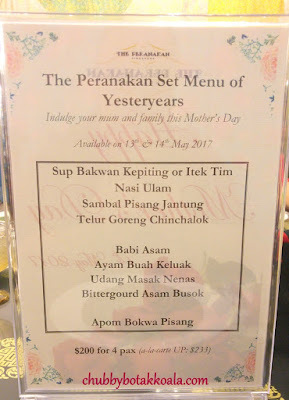 The Yesteryears set menu started with the choice of Sup Bakwan Kepiting or Itek Tim. LD and I choose one of each. Although we have tasted it before, we found the both soup are more robust and intense this time around. The sweetness of the crab and pork were highlighted in every slurp of the Sup Bakwan Kepiting. The meatballs are springy with a touch of crunch in every bite. Meanwhile, the Item Tim soup has that salty and tangy flavour that will wake up your appetite. 2nd dish was Nasi Ulam. The memorable and aromatic Nasi Ulam is presented in a heart shape, to show the love and appreciation to our Mothers. The aromatic fresh herbs especially the lemongrass plus the al-dente texture of the rice. You should treat this dish as a rice salad instead of to be eaten with other dishes. 3rd dish Sambal Pisang Jantung. A Peranakan dish that uses the heart (flower) of a banana plant which normally served during Peranakan Wedding. We are supposed to eat using emping (belinjo crackers) as the spoon. The bitter taste from the emping, bodes well with the sweet spicy texture of the sambal pisang jantung. Topped that with fresh prawn, to give it a natural sea sweetness plus springy texture to this dish. Definitely can be classified as a Peranakan Tapas indeed. Yum Yum. 4th dish, Telur Goreng Chinchalok. Simple comforting dish of fried egg topped with the fermented prawns. Ok, I did skipped the chilli on the top, but LD enjoy it enormously. This fried egg dish is part of The Peranakan regular menu. 5th dish, Babi Asam. Direct translation will be sourish pork. A very delightful dish as the sweetness of the pork belly bodes well with the tanginess of the tamarind. A perfect 'rice thief' dish. 6th dish, Ayam Buah Keluak. This dish does not need further introduction. A well-cooked chicken dish using 'Asian Black Truffle'. According to Chef Raymond, this is a must have dishes in any festive celebration in Peranakan families. 7th dish, Udang Masak Nenas. Fresh prawns, perfectly cooked in the sweet and sour gravy using fresh pineapple. It is rich yet does not feel jelak due to the acidity from the pineapple. While pineapple can tenderise a meat, it helps the prawns to be firm and crunchy. 8th dish, Bittergourd Asam Busok. A gem recipe from Chef Raymond family recipe. Looks like bitter gourd vegetable curry, it is served with fried dough (You Tiao). The bitter gourd is stewed over long period with salted fish and long bean in asam gravy. The bitterness seems to dissipate, while the tangy robust gravy definitely a worthy companion for the you tiao or even white rice. Even LD that does not eat bitter gourd enjoy this dish. Yum Yum. Dessert supposed to be Apom Bokwa Pisang. Unfortunately the Apom wok did not make it back in time. So we got the Kueh Dadar. It is soft pandan skin, filled with coconut shavings cooked with gula melaka. The touch of coconut cream adds to the creaminess of this desserts. Overall, it was indeed an exciting experience to try delicious Peranakan dishes that hardly see in any Peranakan Restaurant. Definitely worth a visit, especially to celebrate this special occasion such as Mother's Day.